Active athletes everywhere, rejoice! Now you can carry all your essentials with the FreeHand by ventureDESIGNworks. Most athletes like to bring along a few essential items when they work out: a cell phone, I.D., insurance card, keys or some cash come in handy. Until now, there has not been an easy way for athletes to carry and access these items on the go. Enter the FreeHand. A small mesh pocket that securely straps to the back of your hand, FreeHand allows for storage of essential items in a convenient location with easy access: the back of your hand! The secure mesh pocket on FreeHand can hold a wide range of small items, from cell phones and iPods to car keys and cash. Made of breathable fabrics, the FreeHand is cool and lightweight for summer runs or rides, comes in two sizes to fit a range of athletes and is easily washable. In addition to being perfect for runners and walkers, FreeHand also works well for cyclists as it easily slips over cycling gloves. "The Freehand is very popular with runners, cyclists and walkers," says Anthony Pigliacampo, President of ventureDESIGNworks. 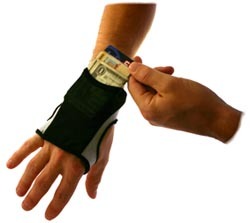 "It's more convenient and less bulky than armbands or clip on pouches and keeps a firm grip on your items so you don't have to. We have been amazed by the variety of uses our customers have found for FreeHand when they head out for a run or bike ride." FreeHand is a must-have piece of gear for any active athlete and retails for $22.00. It is available at running stores and bike shops nationwide. Dealers wishing to pick up the product can contact ventureDESIGNworks directly or acquire the product through distribution partners QBP and Lexco. For more information on the Freehand and other ventureDESIGNworks products, visit www.ventureDESIGNworks.com or call 720 317 5454. Offering a full suite of product design services, vDw applies a unique, user-centered design process to help clients improve their business through innovation. Rather than let clients have all the fun, vDw also designs and markets innovative products for the many gear intensive activities the founders like to partake in such as cycling, running, skiing, climbing, kiteboarding, triathlon and backpacking. To find out more, call 720.317.5454.